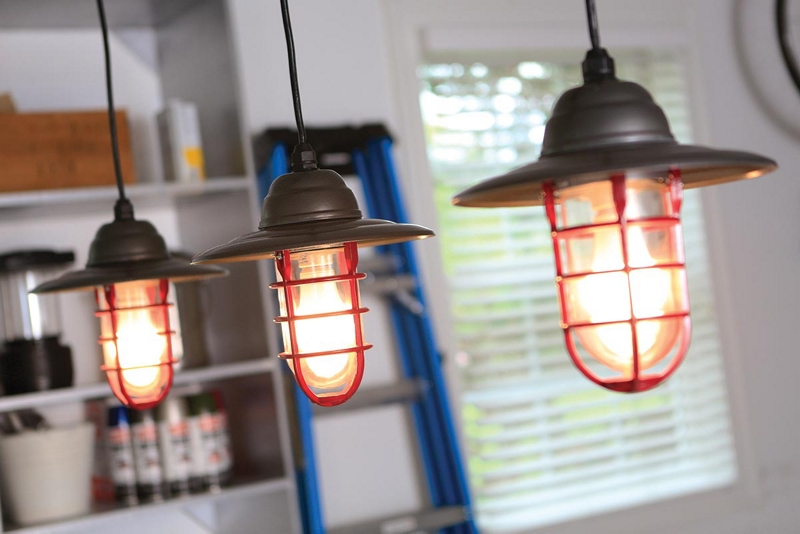 A two-tone combination of Krylon® Rust Protector™ Gloss Enamel - Cherry Red and Rust Protector™ Hammered Finish - Charcoal Gray refurbish old metal overhead lights and brighten your garage workspace. Disassemble metal overhead light fixtures, bulb cover from base. Using an all-purpose cleaner, thoroughly clean the light fixtures to remove dirt, oils and dust. Rinse thoroughly with water and allow to dry. Using Krylon® Rust Protector™ Hammered Finish - Charcoal Gray, paint the base of the light fixture, holding the can 6-8 inches from the surface and using a sweeping side-to-side motion with slight overlap. Using Krylon® Rust Protector™ Gloss Enamel - Cherry Red, hold the can 6-8 inches from the surface and paint using a sweeping side-to-side motion with slight overlap. Krylon® Rust Protector™ dries in 8 minutes or less, and can be handled in less than one hour, although you may wish to wait a few hours before reassembling the light fixtures. NOTE: LED bulb is recommended for lower temperature.